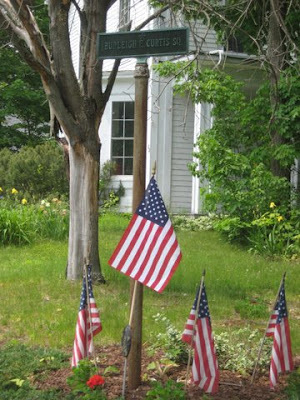 Burleigh E. Curtis Square, Holliston, Mass. I'd long wondered about the story behind this small memorial tucked on the corner of a front lawn across from our church in Holliston. 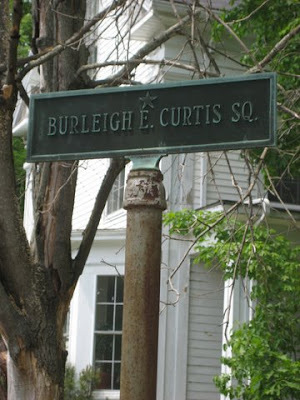 Who was Burleigh E. Curtis? (On June 13, 1944,) The 378th destroyed eight flat cars, a box car and four trucks and strafed 15 trucks. Sadly, 2nd Lt. Leon Bentley of the 378th was killed by his own bomb while attacking a rail target at low altitude. Bentley’s bomb struck the top of a boxcar and bounced before exploding, catching his P-47D, 42-26114, in the blast. A similar fate befell Lt. Burleigh Curtis of the 377th in P-47D 42-75227; caught in his own bomb blast, his damaged P-47 tumbled out of the air, hit the ground and exploded. His squadronmates accounted for 31 military vehicles and 10 more damaged in the area around St. Andre de Briouze.